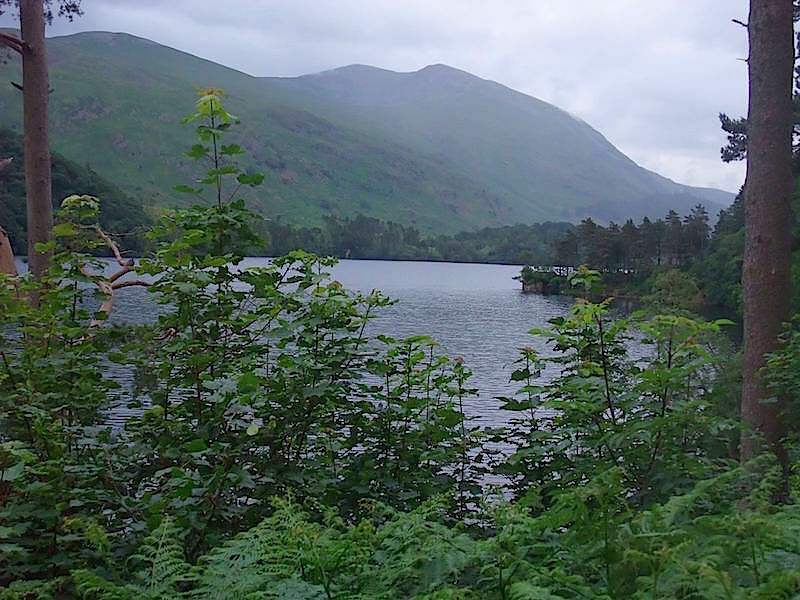 Our starting point today is the United Utilities car park at Armboth, on the western side of Thirlmere. There’s no sunshine on offer but it is warm, although there is a lot of cloud which is making things feel very muggy indeed. 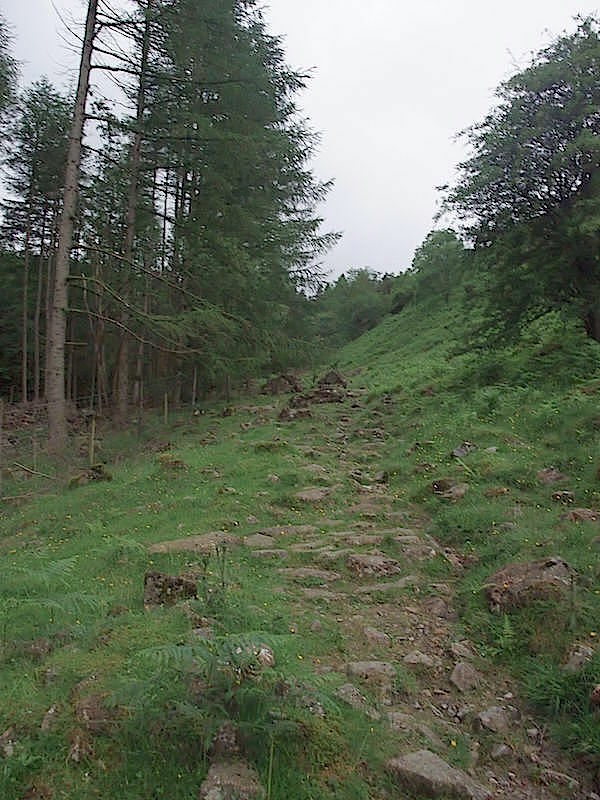 The path is easy to follow but it is a bit of a steep walk up to begin with. 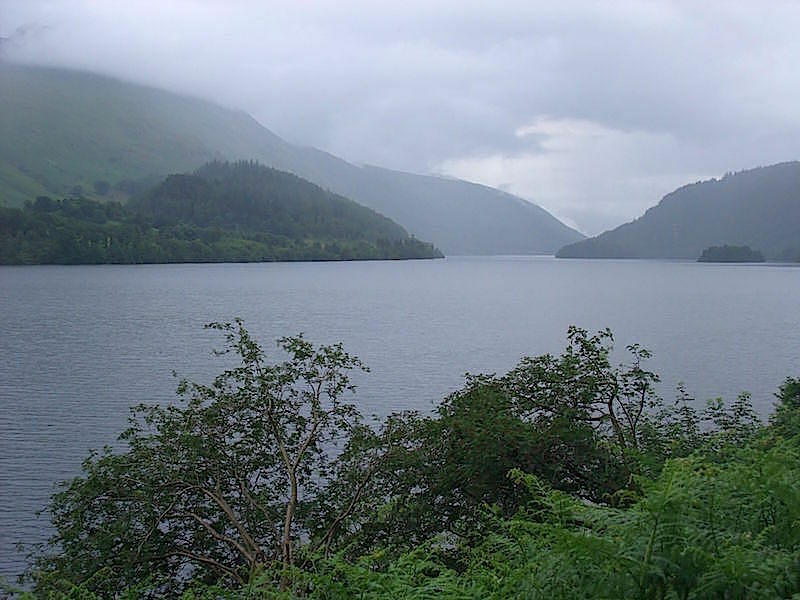 A look back at Thirlmere which has come into view now that we’ve gained a bit more height. 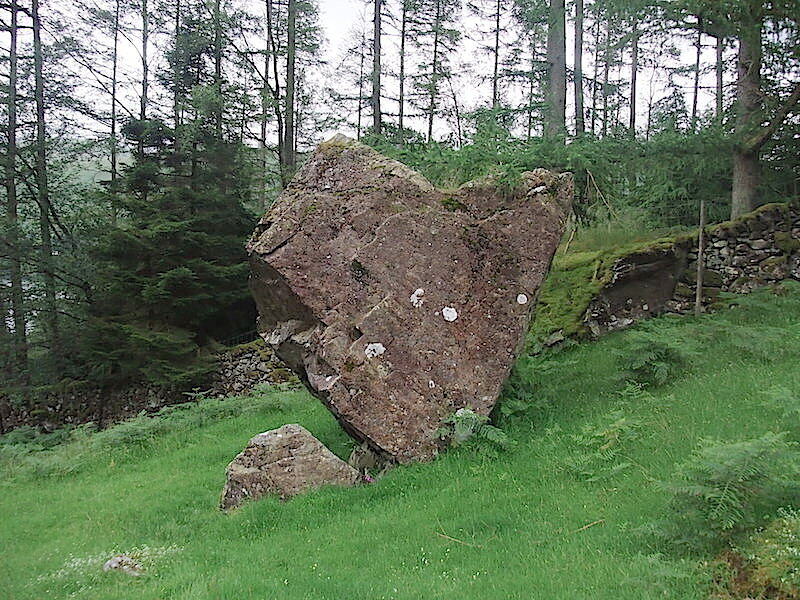 Just alongside the path is AW’s ‘balanced boulder’, an erratic which seems very precariously balanced and which stands about 12′ high. Further along the path and the gradient eases slightly. 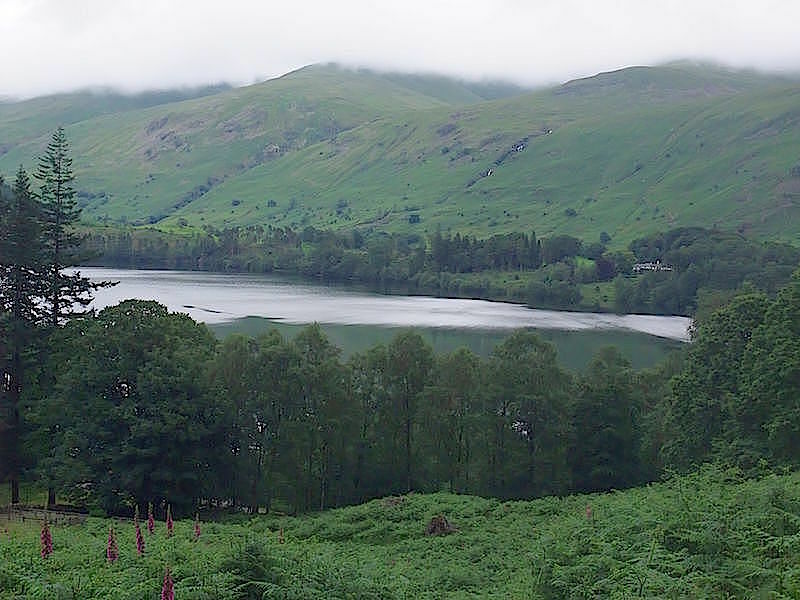 Across Thirlmere and the tops of the Dodds are hidden in the mist. 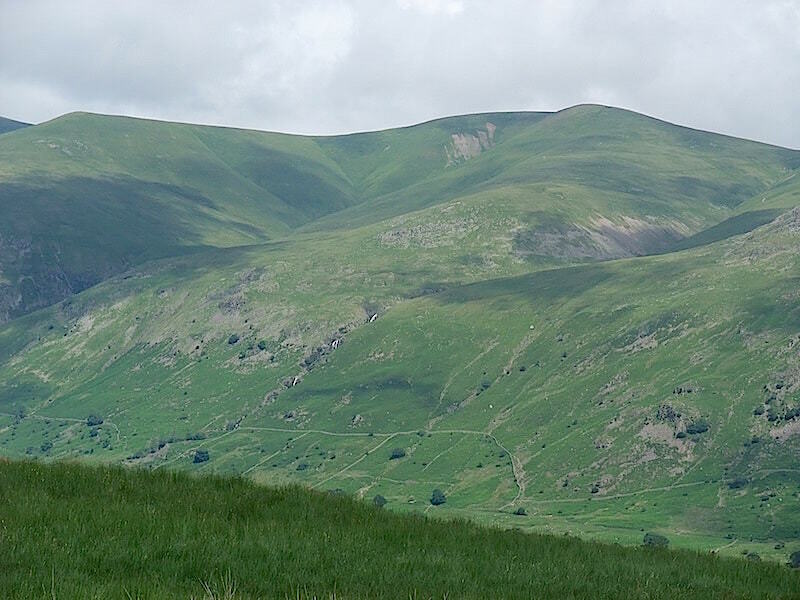 The little fell with the bald patch to the left below them is Great How. 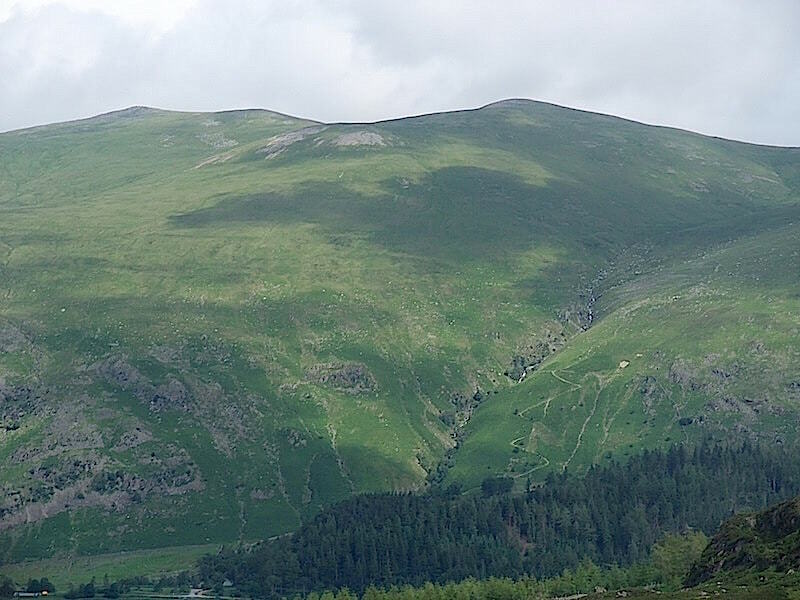 The crags of Armboth Fell over on the left skyline. The fell summit is set further back so it can’t be seen in this view and there’s a jungle of bracken and squelchy grass to get through before we reach it. 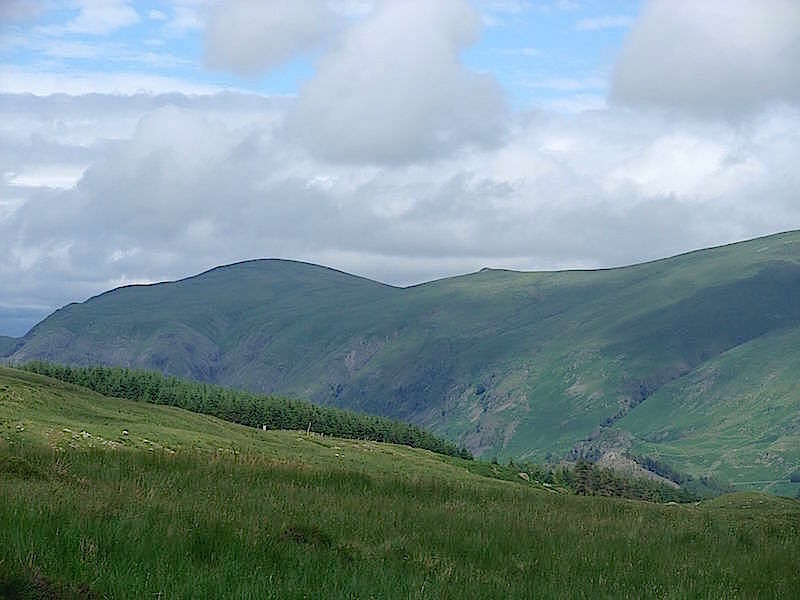 The view to the east, with a tantalising patch of blue sky above Clough Head, over on the left, the little pimple next to it on the right is Calfhow Pike. The view behind us was less interesting, just a slope full of heather and sphagnum moss. Moving to the right of the previous picture, the slope upwards from Calfhow Pike leads to Great Dodd, on the left skyline, and next to that is Watson’s Dodd. 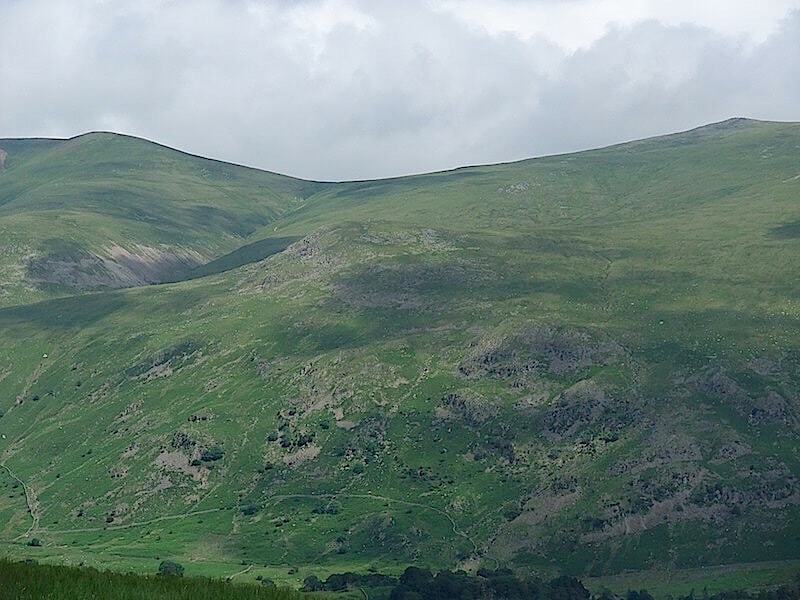 Watson’s Dodd is now on the left and then the long sweep between it and Stybarrow Dodd. A little further to the right and Stybarrow Dodd is now on the left with Raise over on the right. Raise is now to the left with White Side over to the right. 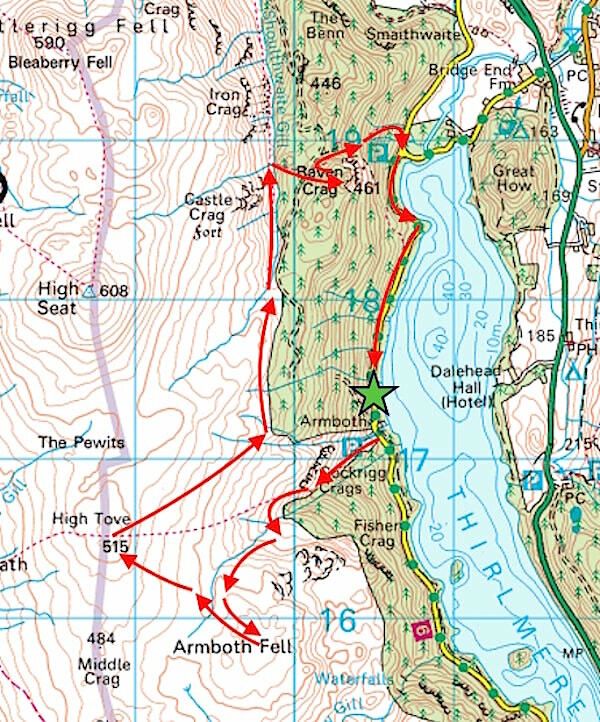 The zig-zag path on the fell side below is the Browncove Crags route leading up to Helvellyn. White Side on the left and Browncove Crags to the right. 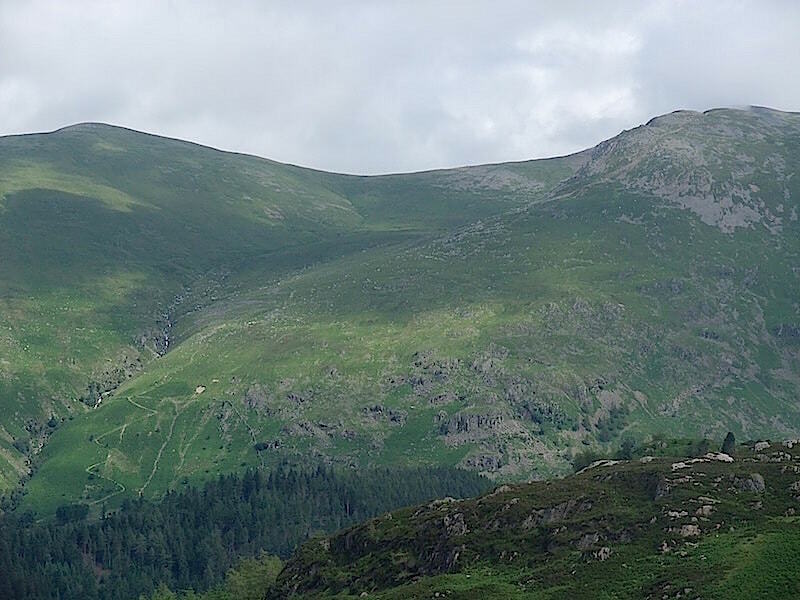 From this angle it looks as though White Side reaches directly to the top of Browncove Crags but it doesn’t. It carries on to Helvellyn Lower Man part of which is just visible behind that bit of cloud above the crags. 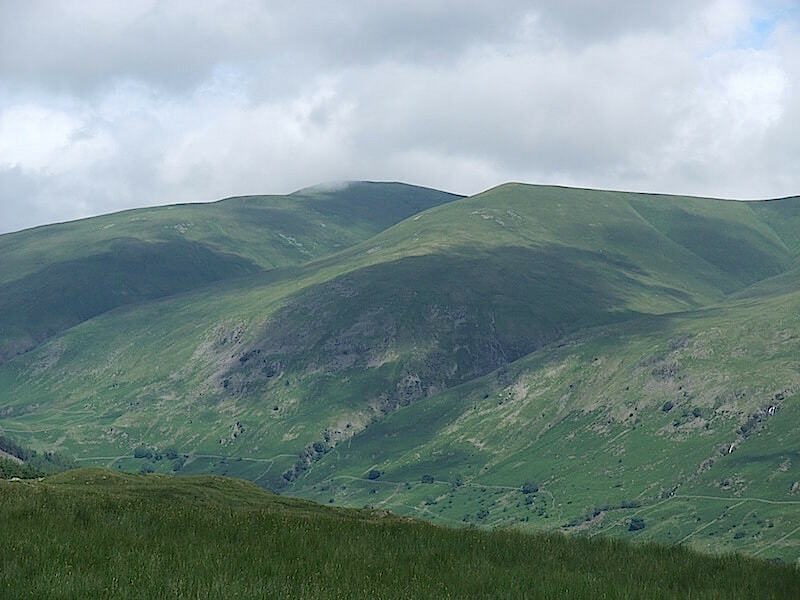 The heathery crags at the bottom of the picture belong to Armboth Fell. 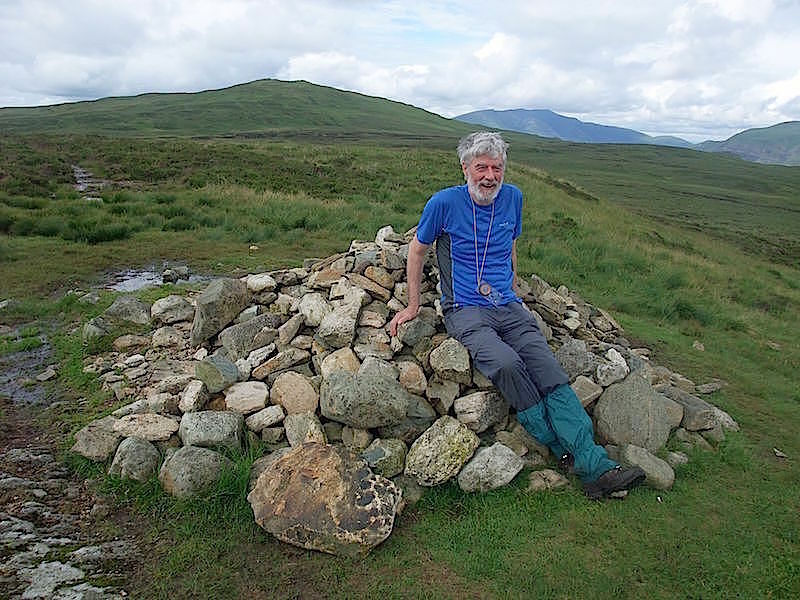 As if by magic we are at High Tove summit cairn and looking northwards towards High Seat. I have no photos in between this shot and the previous one and I have no idea why, probably because the ground is so very wet up here I was more concerned with trying to keep my boots dry, or maybe we were talking. 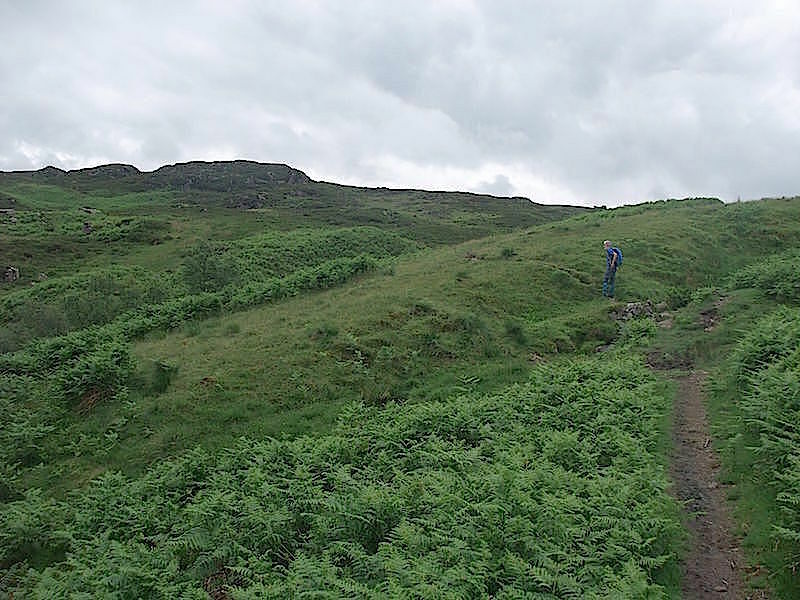 That brown patch between here and High Seat, known as The Pewits, is an extremely boggy depression and is a nightmare to walk through. 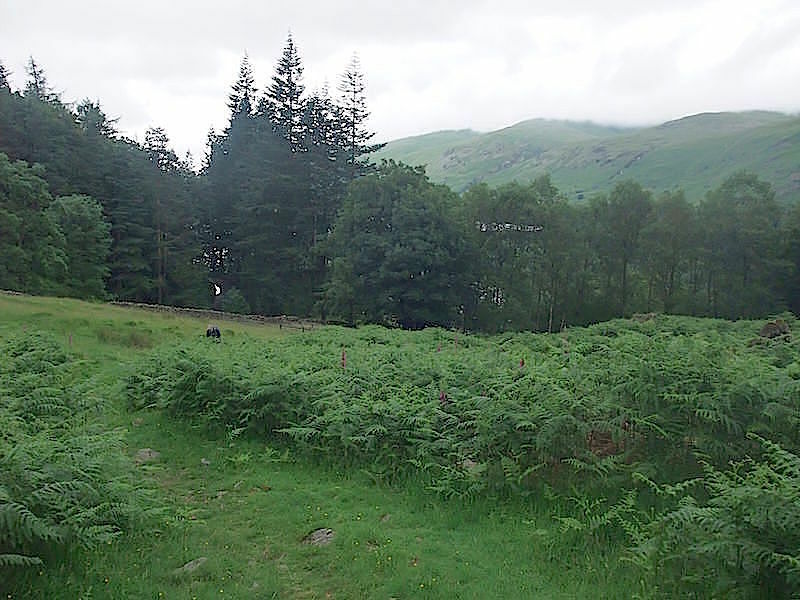 We aren’t going that way today as our next fell is Raven Crag which is across that marshy area over to the right of the shot, that’ll be more zig-zagging round the soggiest bits then. 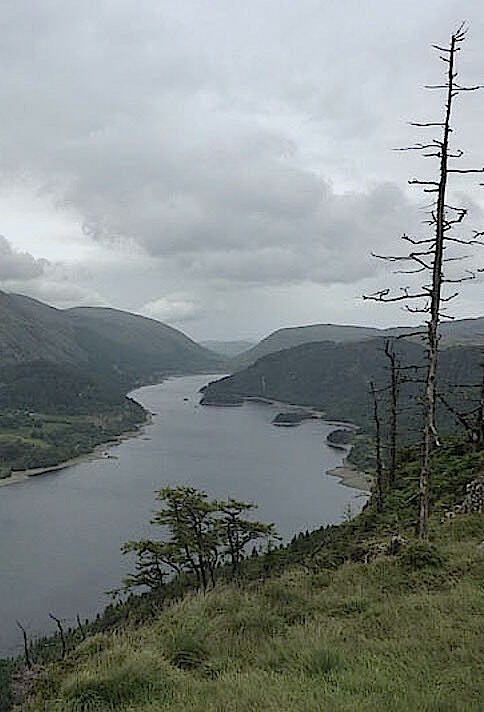 The gloomy overcast view along Thirlmere from Raven Crag. 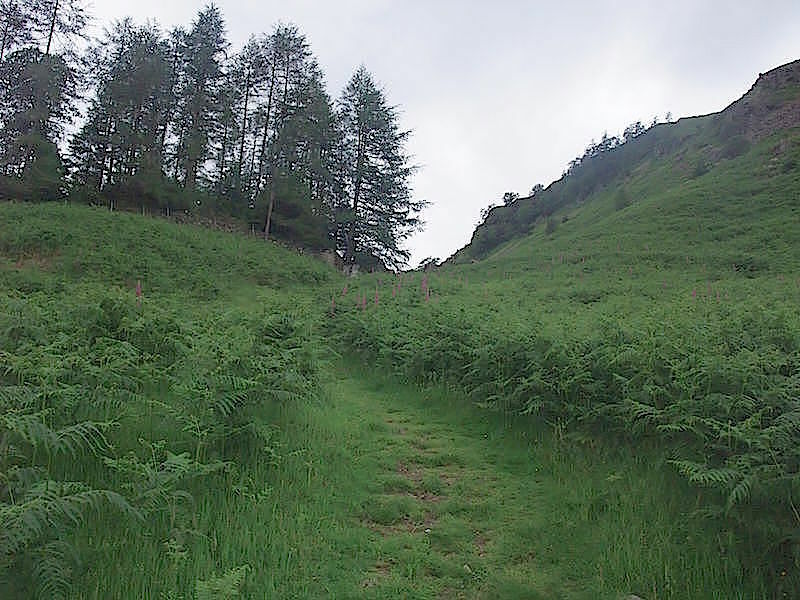 Making our way down from Raven Crag via the forest path, its a bit steep in places. 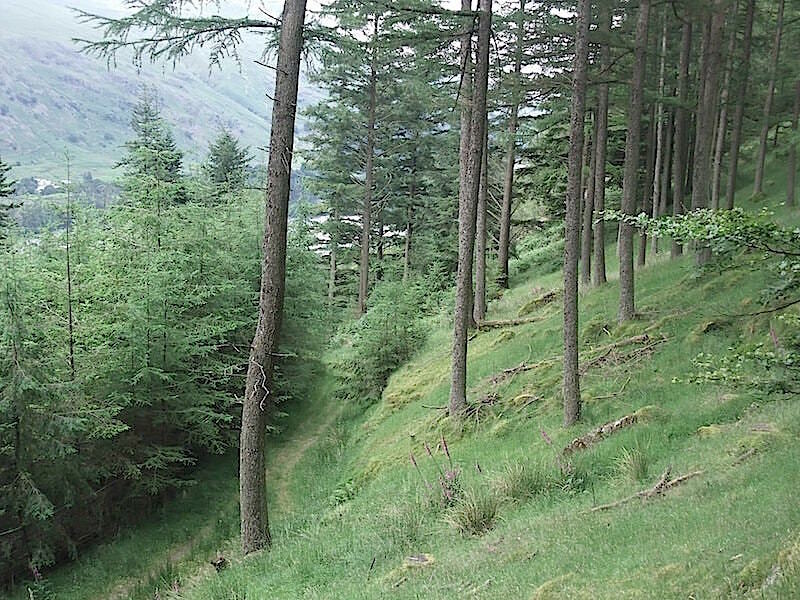 You can just see a bit of Thirlmere through the trees. Back down on the road which runs alongside Thirlmere’s western shore and its starting to drizzle. The clouds rolled in, the drizzle turned to steady rain, so the camera went back in the bag and we put the waterproofs on. 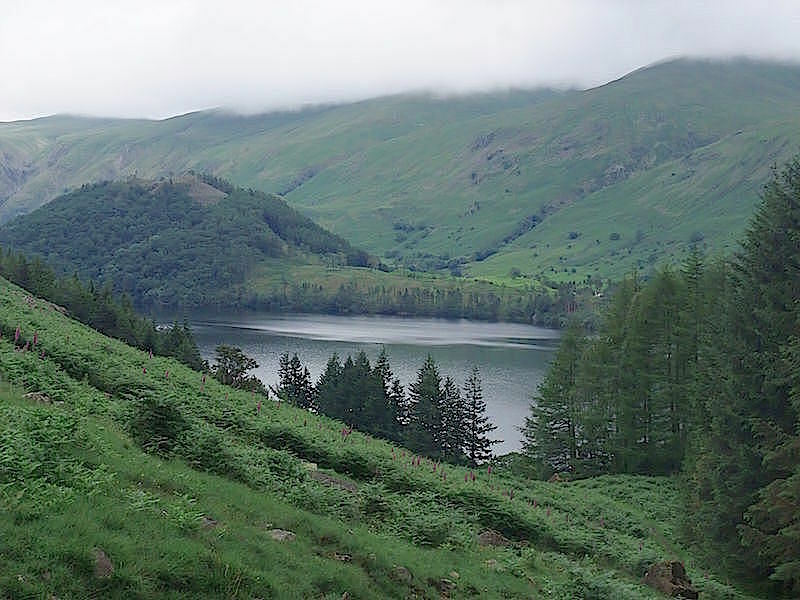 Let’s look on the plus side though, the rain runs off the fells into Thirlmere. An aqueduct, almost 96 miles long, runs from here to Manchester. It carries 55,000,000 imperial gallons per day so that the citizens of Manchester can have cups of tea, wash their socks, and do all the other things that you need water for. So those clouds have a silver lining even if its a struggle to appreciate it as you walk a long wet mile back to the car.